Deputy Sheriff Robert Lee Paris, Jr.
Deputy Sheriff Robert Paris was shot and killed while he and another deputy were serving an eviction notice at the Whispering Woods apartment complex on Chrysler Drive in Modesto. The deputies were attempting entry into the residence around 11:00 a.m. when the suspect opened fire with a rifle, fatally wounding Deputy Paris and a civilian locksmith who had accompanied them. The suspect then barricaded himself inside the residence for several hours before committing suicide after the apartment complex caught fire. It was later determined that the suspect was armed with 22 firearms, a gas mask, and other tactical equipment. While barricaded in the building, he cut through walls into adjoining apartments in order to have multiple vantage points. 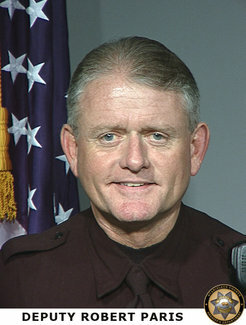 Deputy Paris had served with the Stanislaus County Sheriff's Department for 16 years. He is survived by two adult children, parents, brother, and sister. Deputy Robert Lee Paris Jr. will never ever be forgotten. May his soul forever rest in peace.